Recently I got a chance to read a short Ebook named Lankapati Ka Loktantra (लंकापति का लोकतंत्र) by author Kamal Upadhyay on Juggernaut app. At ThinkerViews, we have talked about Juggernaut books in past and reviewed some of the books published by them. 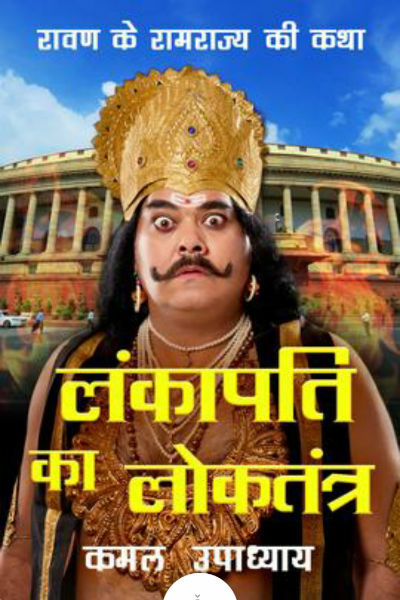 Lankapati Ka Loktantra, is comparatively a short book and importantly it is written in Hindi. Before we talk more about the book, let me tell you that, this book is a light read. It is a satire which takes on many recent happenings. No one needs to get offended by it though. In an interesting series of incidents, Raavan, the mighty king of Lanka, decides to implement Loktantra – democracy – in Lanka. The reasons include (but not limited to), world’s growing support towards democracy opens a lot of doors to earn an uncountable amount of wealth and pleasures. He also wishes that he should get Nobel Peace Prize for his actions, especially for stepping down from the throne. The book also talks about Kuber, the half-brother of Raavan, who holds the most of the wealth around the globe. In a gesture of humbleness he used to give loans to almost everyone who needs it and in return he gets the control over the person’s wealth and life forever. Raavan thought that it is not wise for him to compete for the throne in the election and thus he let Vibhishan become the candidate. The results of the election are quite predictable and Vibhishan became the next ruler of Lanka. Raavan still enjoyed the power he has. However, gradually, politics took its own course and the amount Raavan used to get to maintain his properties shrunk over time. There came a point when it became almost impossible for him to manage his resources using the money he receives from the ruling government. He then decides to file his own candidature. How he becomes the next ruler and how Lanka blossom(!) under his rule, and how Raavan’s personal life is affected by his political actions, is explored in the book. This book is for anyone who can read a satire with an open mind. The writing of the book is flowless. There are places where a little adultery is referred, but rather than that, at a majority of places, the book respects the modesty. The most intriguing part of the book is the way it takes a dig at some of the recent political happenings. The book is not a masterpiece for sure, but, if you want something as a light read, you can surely enjoy this book. There are several things which are out of focus, for example, there is a reference to Duryodhan. Now, Duryodhan is a character from Mahabharata, while this book is exploring the incidents of Ramayana. At the same time, we can also grant this to the author, as it cannot be said that, Duryodhan was the name invented at the time of Mahabharata only. Anyone, before or after the time of Mahabharata could have been given that name! Also, this is not the retelling of Ramayana (as Corpokshetra is a kind of humorous modernized retelling of the Mahabharat), so don’t expect all the incidents of Ramayana to be found in the book. Several punchlines mentioned in the book makes it worth reading and some of them even put the book in “classic” category too! Here are some of the lines from the book, which I found interesting. जिस व्यवस्था से त्रस्त होक विभीषण ने चुनाव लड़ने का निश्चय किया था, अब चुनाव को जीतने के लिए वो उसी व्यवस्था को बढ़ावा दे रहे थे, वह भी क़र्ज़ पर पैसे लेकर. उस समय में भी एशिया के लोगों को पश्चिम वाले कोई पुरस्कार नहीं देते थे. रावण यदि युद्ध करने नहीं जाता तो रोज़ रात को वो पागल गोस्वामी के न्यूज़ के साथ ही खाना खाता था. रावण ने बताया किस तरह उन्होंने कलयुग में घोर कलयुग देखा. रावण ने कहा की उस कतार में एक भी इंसान ऐसा नहीं था जो सिर्फ भगवान के दर्शन के लिए आया हो. रावण के अंदर भी तो एक दानव था जो ज़िन्दगी के हर मज़े को लूटना चाहता था. शक्तिशाली व्यक्ति का सम्मान करने के आलावा लोगो के पास कोई चारा भी नहीं होता है. धर्मपत्नी ने साथ ना आकर रावण को जो खुशिया दी थी उसके बदले में रावण लिस्ट में लिहा हर सामान अपनी पत्नी के लिए ले जाना चाहता था. यदि आप के देश में तेल का कुआं है तो आप को भी अमेरिकापुर से डरना चाहिए क्योंकि तेल अमेरिकापुर को सबसे अधिक प्रिय है. In addition to Indian politics, this book takes on the greediness of other countries. It also talks about a road accident, where a celebrity runs his vehicle over the poor fellows and gets evicted from the court of law. There are many such incidents mentioned in the book, but telling more about them will result into spoiling the interesting segments of the book and thus ruining your reading experience. While I got a free reading coupon for this book, it is available for Rs. 50 only on Juggernaut, when I was writing this. In that terms, this book is definitely worth its price. And yes, Kamal Upadhyay is definitely an author, we can look forward to. Definitely a worth reading book for light mood, only if you can read it with an open mind and a witty satire is your cup of tea. We would love to give it 7 out of 10 stars. We are thankful to the makers and the website both for providing such an easy and useful tool. We are delighted to share with you that we got a chance to have a small communication session with author Kamal Upadhyay. You can read the full author interview here.